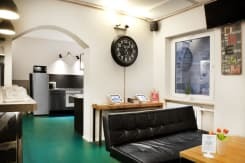 Five Reasons Hotel & Hostel is located in the city centre of Nuremberg directly next to the historic city wall. 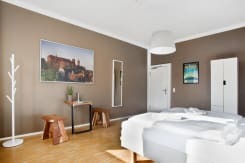 Most attractions, shops and sightseeing spots are within easy walking distance and the nearest underground station is just a stone’s throw away. 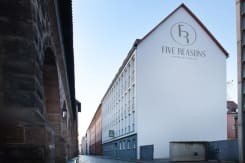 Whether you´re here for sightseeing, enjoying a night out with a few drinks, going to the exhibition centre or just enjoying the city - Five Reasons Hotel & Hostel is the place to be! We try our best to be the perfect host for people from all over the world. And your ratings make it pretty clear - over 2.000 brilliant reviews make us one of the best hostels in Germany! We are determined to improve our outstanding service every single day. helping you to find your way round the city, pointing out all the can’t-miss spots as well as recommending the best local restaurants and bars. Bavarian beer is good, Franconian beer is delicious (Nuremberg is the capital of Franconia, the Northern region of Bavaria)! 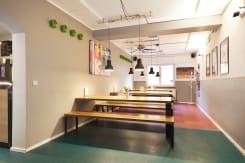 We pride ourselves on offering a wide selection of local beers to keep you company while you chill out in our common area, meeting people from all over the world and sharing your experiences. For those preferring other drinks we have a small bar where we serve a variety of drinks – in the summer you can enjoy them on our outdoor patio! We offer different kinds of rooms to suit every budget and preference. 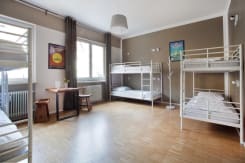 For the socially inclined we have really stylish 4, 6 or 8 bed mixed dorms as well as extra female dorms for the girls who want to stay among themselves! All our dorms have lockers, private reading light and socket for every bed and the bed sheets will already be on your bed when you check in. Free of charge, of course. 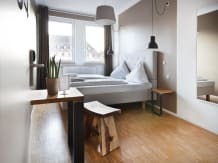 If you´re looking for that extra bit of privacy our double rooms with superclean shared facilities are the right choice! 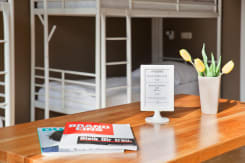 No matter in which type of room you are staying, you will have free wi-fi access in all the rooms and everywhere else. 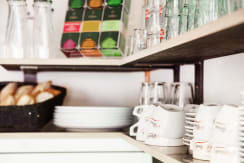 All our guests can use the fully equipped guest kitchen to cook their own meals. 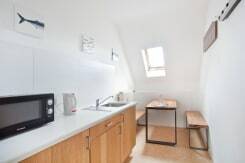 If you want to give yourselves a special treat, you can book one of our really nice private apartments for your friends and family! 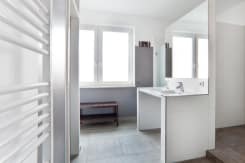 They offer space for up to 6 people and come with a private bathroom and kitchenette. Whether you are travelling by car, train, plane or arrive here on bike or on foot, Five Reasons Hotel & Hostel is really easy to reach. The main train station is just a 10 minutes’ walk and the nearest underground station “Opernhaus” is just one minute away. 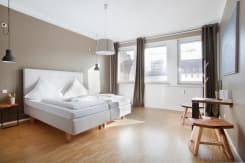 It´s clean, cool and in the heart of Nuremberg. 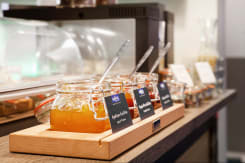 Enjoy Five Reasons Hotel & Hostel! Cancellation Policy: 3 days before the arrival date. We have 24 hours reception times. You can reach the Hostel easily. You can walk 7 miuntes from the main train station - You just exit the station and walk left (along the city wall) after 600 meters you reach the subway station \"Opernhaus\". At this point you cross the city wall and go left and there we are. House number 42. Or you just go one stop with the subway (metro). The train starts in the basment of the main train station. You talk line 2 (direction Röthebach) or line 3 (direction Gustav-Adolf-Str.) You get out at next stop \"Opernhaus\". Here you take the exit in th middle of the platform cross the city wall and walk left. The main bus station is next to the main train station so just use the disciption form the main train station. In the basement of the airport is the final stop of the subway. Just take any train and get out a the stop \"Opernhaus\" it takes around 15 minutes. Here you take the exit in th middle of the platform cross the city wall and walk left. 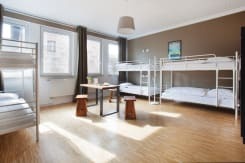 The hostel is right in the center of Nuremberg is nevertheless easy to reach by car, train and airplane. Within walking distance you can reach the city center, with its attractions. All other attractions and the exhibition center are easily reached by public transport.